In a mixing bowl whisk together olive oil, lime juice, garlic, chili powder, cumin, paprika, cayenne, oregano and season with salt and pepper to taste. Place fish into a gallon size resealable bag and pour marinade over fish. Seal bag (move bag around to evenly coat fish with marinade) and allow to marinate in mixture 20 minutes. Preheat a grill to medium-high heat. Take a Piece of foil and spray with non stick cooking spray wrap fish in foil. Grill until cooked through, about 3 minutes per side (cook time will vary based on thickness of fish). 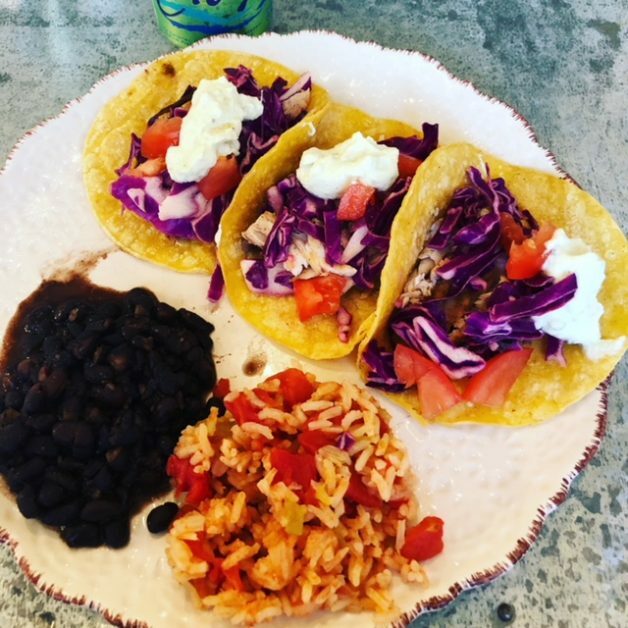 Transfer to a plate, break into 4oz servings then into pieces and serve in warmed taco shells with cabbage slaw, avocado dressing and other optional toppings. Add cabbage and cilantro to a medium mixing bowl. Pour lime juice over top and season lightly with salt and pepper. Toss to evenly coat. Allow to marinate in the fridge. Add the avocado to a small bowl and mash it with a fork. Then add the cilantro, lime juice, cumin, Greek yogurt and salt and pepper. Mix well until creamy.